Colorado Criminal Law – Auto Stops – Smell Of Marijuana – Searches of Your Car – Before the police can conduct a search of your car at a traffic stop – the police officer must have either your consent or something called “probable cause” to believe you have done something illegal. To fully understand how to act to best protect your rights during an automobile stop – you must understand those rights and know what to do, and not do, to act to protect yourself at the actual scene of the stop. This article addresses two recent Colorado cases, People v. Zuniga and People v. Cox to help explain what can happen at the scene of the stop and just how bad things can break with the police when you do not act to carefully exercise and protect your Constitutional rights. There is usually a three pronged attack underlying the Motion to Suppress Evidence. Prong III. The vehicle search was not supported by probable cause. While I have written other articles on these subjects, this article focuses on the Fourth Amendment’s requirement of Probable Cause, the Totality of the Circumstances Test and Canine Alerts. What follows is a hypothetical fact pattern developed to demonstrate what typically happens in a Colorado automobile stop by the police. 1. A Colorado Police Officer stops your car for an alleged traffic violation – such as speeding. 2. The Officer approaches your window and asks for your registration, driver’s license and proof of insurance. In this fact pattern (taken from the Cox case) the car you are driving is an overdue rental from another state (California) and you have driven “straight through Colorado” on your way to another state (Nebraska). 4. The Officer then sees something in your car that draws his attention – in this case – you have two cell phones on the back seat. 5. You answer the Officer’s many questions about where you are coming from, where you are going, and your “story,” – according to the officer – is “inconsistent” – much of the time line is “unexplained” in the opinion of the officer. 6. The Officer ask to search your trunk and, for the first time, you exercise one of your rights and you say no. 8. The trunk is opened and illegal controlled substances are located inside. 9. You are placed under arrest and Mirandized (read your rights). To understand how to protect yourself from this hypothetical nightmare – you must understand the law and your rights. We all talk about our rights, but few of us truly understand what they are and how to exercise them properly notwithstanding the efforts of great organizations such as the ACLU. These organizations try to convert the perceived legalese of the Constitution to “action plans” you can utilize at the scene of a traffic stop. The People have a Constitutional right to be free from unreasonable searches and seizures under the Fourth Amendment. U.S. Const. amend. IV; Colo. Const. art. II, § 7. 1. Is with your consent. 3. Falls within a recognized exception that permits a warrantless search. One of the exceptions to the Fourth Amendment’s requirement of a warrant applies to automobiles: The Police are allowed to search an automobile without a warrant if they have probable cause to believe that the automobile contains evidence of a crime. the facts available to the police officer would warrant a person of reasonable caution in the belief’ that contraband or evidence of a crime is present. Probable cause is based on “factual and practical considerations of everyday life on which reasonable and prudent people, not legal technicians, act.” It is a fluid concept and turns on the assessment of probabilities in particular factual contexts and is not readily reduced to a neat set of legal rules. What Is The “Totality Of The Circumstances” Test? To successfully analyze the “totality of the circumstances” a Colorado Trial Judge must consider more than all of the individual circumstances of a case. This is where the canine sniff search comes into the Trial Judge’s evaluation in our hypothetical. The Colorado Courts of Appeals has held in People v. Cox and People v. Zuniga – a canine alert for marijuana is but one fact that a Colorado Trial Judge will consider in combination with all the other facts in the case. While there may be an innocent explanation for a canine alert – such as a legal amount of marijuana in the trunk of the case – under Colorado law, – while that particular circumstance “may add a level of ambiguity to a fact’s probative value in a probable cause determination….it does not destroy the fact’s generic levitra 20 usefulness outright and require it to be disregarded” within the “mix” of information used to establish probable cause at the time of the totality of the circumstances analysis. 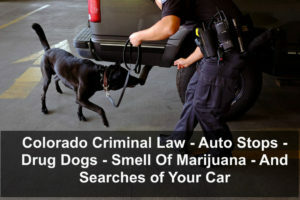 If Smoking And Possessing Marijuana Is Legal In Colorado – How Can The Police Use The Smell Of Marijuana To Search My Car? While Amendment 64 of the Colorado Constitution allows possession of small amounts of marijuana, there remains a substantial number of other marijuana-related activities that are unlawful under Colorado law. Therefore, the Colorado Courts of Appeal have held that the odor of marijuana is still suggestive of criminal activity and therefore is still relevant to the totality of the circumstances test and can contribute to a probable cause determination. While it is true that possession of a legal substance cannot form the basis of finding probable cause to search for contraband, it is important to understand that, a canine sniff search – when combined with other facts – may be enough to reach the probable cause threshold. Key Issue: What Can You Do To Protect Yourself At The Scene Of An Automobile Search? You can learn much from the mistakes of others. In the Cox and the Zuniga cases, the Defendants, decided to answer the officer’s questions at the scene. This decision to “cooperate” was ADDED TO THE MIX OF FACTS used by Colorado Supreme Court to affirm and support the Police Officer’s probable cause determination and arrest. Never, ever, ever cooperate with the police at a traffic stop. Identify yourself, present your driver’s license, registration and proof of insurance and ask for a lawyer. Answer NO QUESTIONS. AGREE to NOTHING. CONSENT to NOTHING. A review of the Cox case establishes why this approach may have worked on behalf of the accused. While the Colorado Supreme Court held that a so called drug dog who alerts on a trunk – even though marijuana is legal to possess in Colorado, – may contribute to a finding of probable cause – the old rules of probable cause still remain. That means in these cases, but for the utterances of the suspects, the Courts would NOT have held that under the totality of the circumstances, the Police had probable cause to search the vehicle’s trunk. While the Court unfortunately found that the canine alert could be considered in this case, there were three other factors that the Court used in the totality of the circumstances analysis to find probable cause to search the car. It is very helpful to study those findings to determine what could have been done by the Defendant to prevent such a finding. 4. “Inconsistent Explanations” Regarding Travels. The Court’s conclusion that there was probable cause to believe this was drug trafficking, was based on those four factors. How Could Things Have Turned Out Differently? 1. The Canine Alert (discussed above) – nothing much you can do here. 2. The Cell Phones – could have been hidden from view. 3. Unusual Nervousness – While difficult to control, this is an extremely subjective assessment on the part of the Police Officer. One way to document the absence of nervousness would be to video (using your smart phone) the encounter with the Police and, of course, you could also stay as calm as possible. Had Cox not offered ANY explanation in response to the police officer’s questions – there would have been no “inconsistent information regarding his travel plans.” Finding probable cause which supports a warrantless arrest often occurs when a Defendant offers implausible, inconsistent explanations to the Police Officer’s questions. Offering which may be obviously false and inconsistent or conflicting explanations, may give rise to “a reasonable inference” that the defendant is attempting to conceal illegal conduct from the Police. On the other, there is NO possibility of such an inference if there are no answers to the Police Officer’s questions. All that is required is.. If you take away nothing more from this article – take this – there are four things you have to say in every police – citizen encounter. 1. Am I under arrest or am I free to go? 2. NO Sir – I do not consent to any searches. H. Michael works hard to get his clients the best possible results in and out of the courtroom. 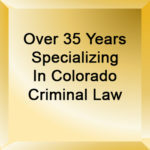 He has written, and continues to write, extensively on Colorado criminal law and he hopes this article helps you in some small way – Colorado Criminal Law – Auto Stops – Drug Dogs – Smell Of Marijuana – And Searches of Your Car. Before the police can conduct a search of your car at a traffic stop - the police officer must have either your consent or something called "probable cause" to believe you have done something illegal. To fully understand how to act to best protect your rights during an automobile stop - you must understand those rights and know what to do, and not do, to act to protect yourself at the actual scene of the stop.